Central American migrants wait to be taken into custody after crossing into the United States from Mexico on Feb. 1, 2019, in El Paso, Texas. 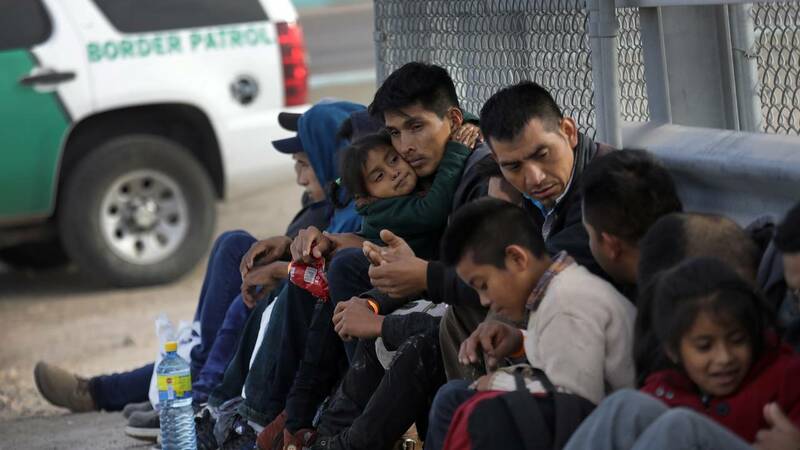 (CNN) - Customs and Border Protection has begun releasing some migrants apprehended crossing the Texas border illegally with notices to appear in court because of limited space in detention facilities in the Rio Grande Valley. According to a CBP official speaking on background, 50 people were released Tuesday and 200 people are expected to be released Wednesday. The official calls it a "temporary measure" and says the move is being made "due to limited bed space" and "to mitigate risks to both officer safety and vulnerable populations under these circumstances." Immigration and Customs Enforcement has also released families along the southwest border due to capacity issues and the inability to hold families longer than 20 days. Both the ICE and new CBP policies are in effect a return to "catch and release" policies that the Trump administration has criticized. Individuals are released with a notice to appear in court. According to a Department of Homeland Security official, the last similar releases were in 1998. Border Patrol can release people, but generally does so only in rare humanitarian circumstances. DHS has begun returning some asylum seekers who present themselves at ports of entry in California to Mexico for the duration of their immigration proceedings and has indicated it plans to expand the practice across the southern border. This policy is being challenged in court. The Wall Street Journal first reported the plans to release some migrants with notices to appear in the Rio Grande Valley sector.